Come on Vogue! Let your body move to the music and become a material girl like Madonna whose hit songs and iconic fashion sense ruled the decade in this 1980s Pop Star Ladies Fancy Dress Costume. The outfit includes a Black top and gold jacket with leopard print trim, a short black tutu style skirt with a net material over skirt finished with a black lace hemline. To accessorize in true 80s fashion there is a pair of lace look gloves, silver cross necklace and oversized black bow hair clip. 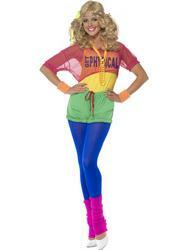 A perfect costume for a 1980s or music themed fancy dress party.